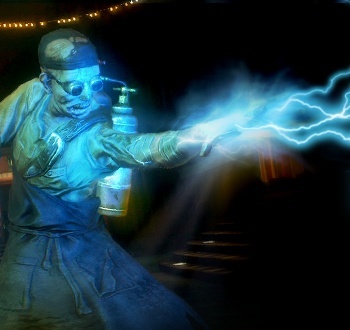 A second batch of multiplayer DLC for BioShock 2 will apparently be released this Thursday. The new Rapture Metro Pack will include six new multiplayer maps based on BioShock 2 levels like Dionysys Park, Siren Alley and Pauper's Drop, along with two masks, three new Achievements/Trophies and a new game mode called "Kill 'Em Kindly," which restricts players to melee weapons only. According to reports, the "Kill 'Em Kindly" mode will be available to everyone, even players who don't purchase the DLC. The multiplayer level has reportedly been raised for the new DLC as well, although there's a bit of confusion on that point as some sources are saying it will actually remain at level 50, the cap set in the first BioShock 2 DLC. The new pack will also include a "Rebirth" option, which according to PS3Trophies.org is the BioShock equivalent of "prestiging." The odd thing about all this is that although reports of the new DLC have popped up on sites including Major Nelson and PS3Trophies, not a word has been said about it by 2K Games. With the DLC set to launch in two days, you'd think somebody over there would be making some noise about it. We've sent over an inquiry/wake-up call and will update if we hear back. UPDATE: Although initial reports had the Rapture Metro Pack coming out on Thursday, 2K Games has now confirmed that the DLC update won't be coming out quite that soon. "The Rapture Metro Pack is coming soon for Xbox 360, PS3, and Games for Windows Live for 800 MS Point or $9.99," Community Rep Elizabeth Tobey wrote on the Cult of Rapture. "Stay tuned for more details on the exact release date of the content (and other fun tidbits we will have in store for you!)"